Hi guys! This week I am busy working on my How to Cross Stitch posts as well as a craft room "Where is it now" sort of post. Lots of photography and editing going on here even some old school paper and pencil note-taking and outlining. It's serious. 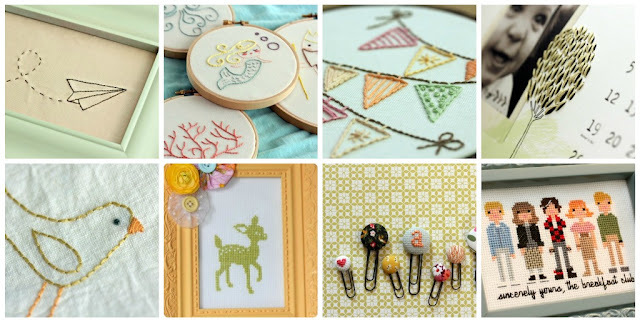 As some of you know, I am a needlework contributor over at 30 Handmade Days. 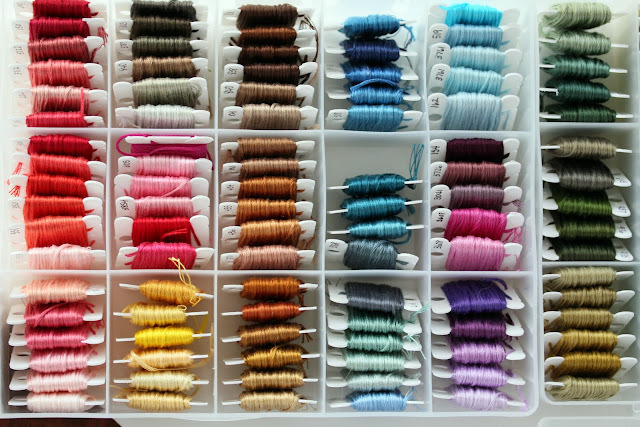 I figured while I am doing some behind the scenes work I would share my 30 days embroidery guest posts with you. Enjoy! When Mique contacted me to become a needle arts contributor on her blog, my first thought was "YES!" and about 3 seconds later was "Uh-oh". I am pretty new to needle arts - I'll admit it. I have been embroidering for less than a year, with cross stitch being the only needle art I have been doing for as long as I can remember. Let me tell you - I was one cool 12 year old toting around cross stitch projects. Add in the fact that I went through a phase where all I wore were stirrup pants and my dad's XL t-shirts - it's a wonder I am able to function socially. Anyways, after thinking some more, I believe this is actually perfect. When I share embroidery projects on my blog, I always get comments about wanting to learn "someday" or it being hard or not knowing where to start. Well, let me assure you, from one newbie to the next - you can do it! And if you aren't a newbie, I will also have some fresh project ideas and if you are an expert, it would be great to have you chime in. I think everyone will be able to join in on the fun, so I am excited to get going. 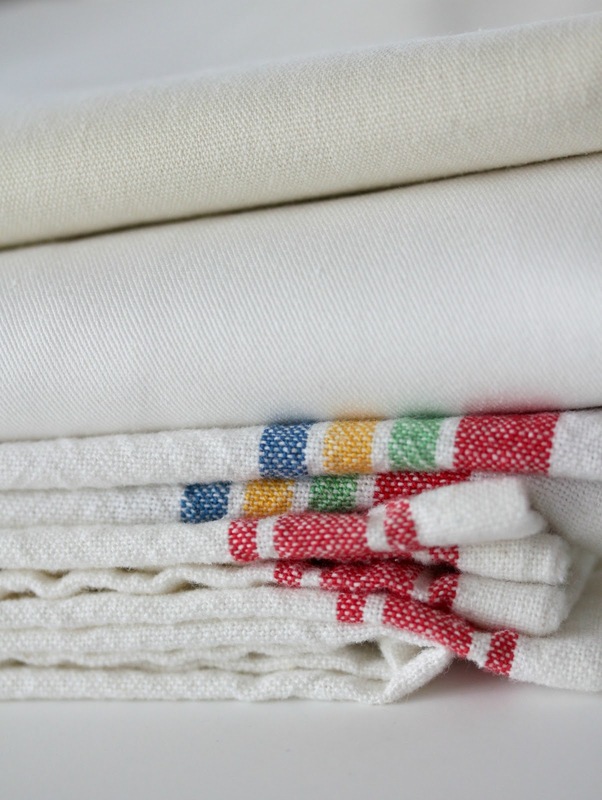 We are going to start at the very beginning - what you need to get into embroidering. Needles. Of course. I use this variety pack from the craft store. I like having a few different sizes depending on how many strands of embroidery thread I am using. Hoops. 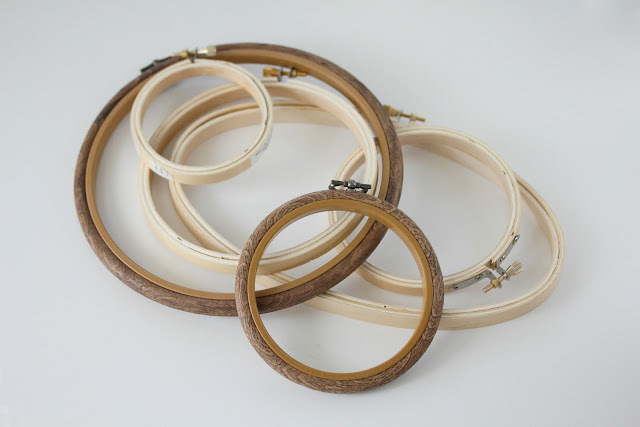 There are plastic and wood and square and circle and oval hoops. All kinds. I like the simple wooden ones. They are simple, plain, and best of all - cheap! Embroidery scissors. This is not an absolute must if you aren't ready to spend the money, but I would recommend them. If you aren't ready to buy embroidery scissors, you will need some sort of scissors to cut thread. 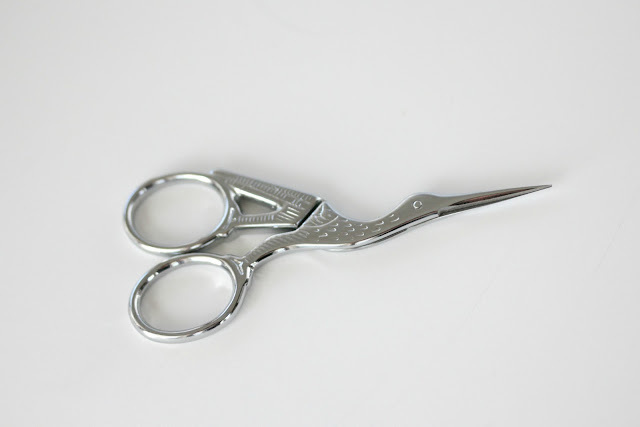 However, a good, sharp pair of tiny scissors can help you with pulling out stitches or clipping tiny threads. Plus they are cute and I have always wanted a pair so I pretty much needed them. (by the way, I want these). Patterns. 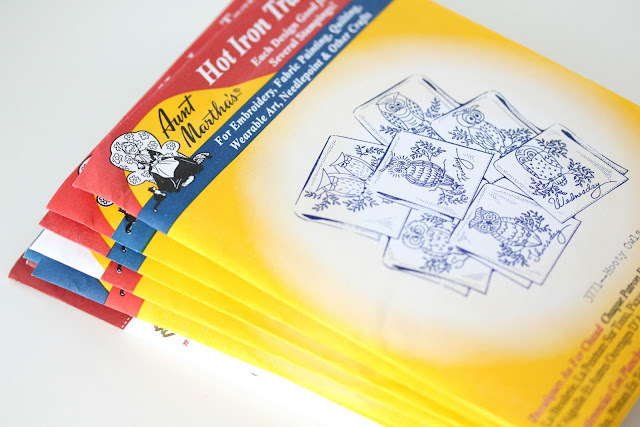 There are iron on patterns, books, pdf's, and well, anything that inspires you. The source of your pattern will determine how you transfer that pattern, so it is something to keep in mind. For instance, I am not a huge fan of iron on patterns, although I am a huge fan of the designs. So, what do I do? I trace the pattern onto tracing paper and then use a light source to trace it onto the fabric. Confused? Let's keep going. 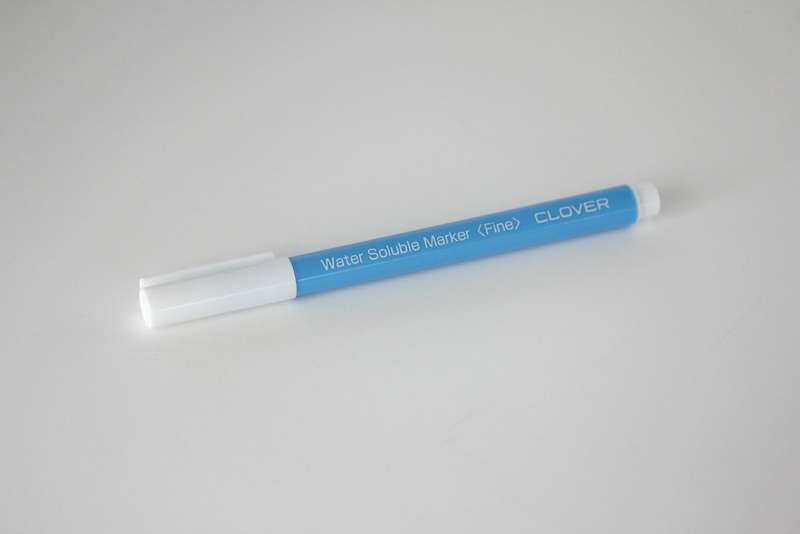 Water soluble marker. Here is my favorite way to transfer patterns: a window. Yep. I tape my pattern to the window, tape my fabric over it, and use this marker to trace. 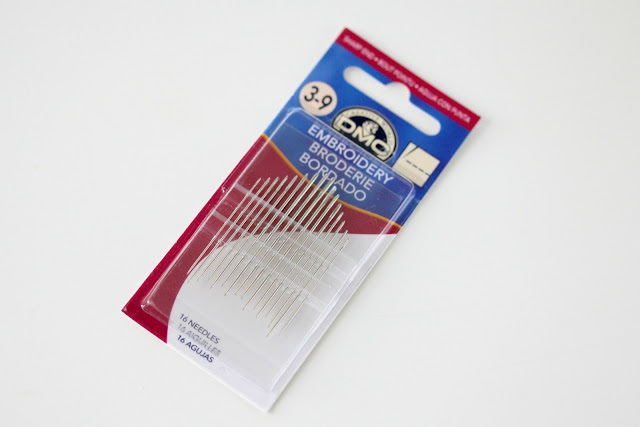 When I am done embroidering, I use a Q-tip to dab water on the marker lines and they disappear. So that's it - the very basics of getting started in embroidery. If you are looking for a good book to get you started, I would recommend Doodle Stitching - the Motif Collection or Embroidered Effects. 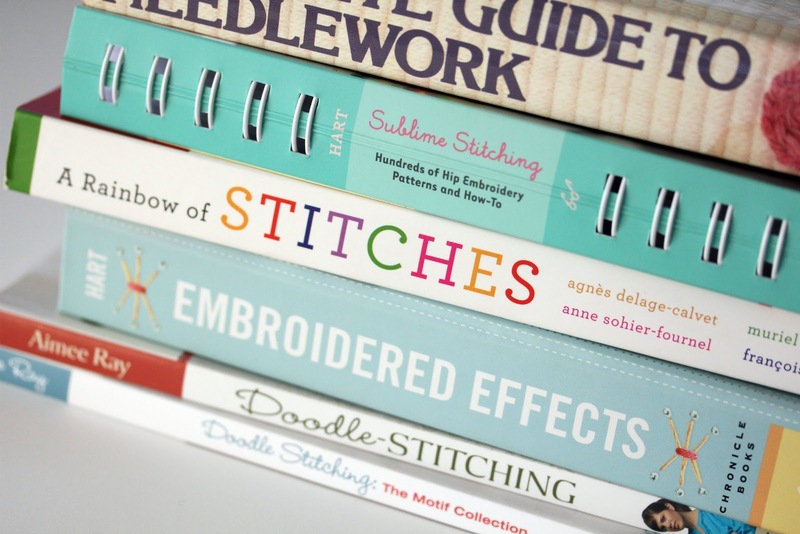 Both of these books cover the basics, stitches, and have lots of cute patterns. For more, check out my embroidery and cross stitch projects, or just take a look around. 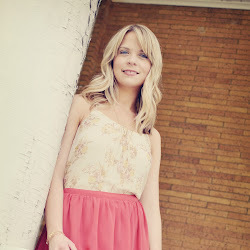 You can also find me on facebook, twitter, and pinterest. I'm inspired. I'm pretty sure I don't need another crafting hobby but I'm totally intrigued and wanting to do this now. Thanks for sharing. I'm looking forward to more how to posts. Thank you so - so much for this post. I was actually going to e-mail you about how to get started! I just bought a book full of adorable owl patterns I can't wait to try! Excited to see more posts on the topic! Ps: I bought a kit for children at Joann's, opened it up - and had no idea how to start. So, again... thank you! Oh my goodness! I have made that Brerakfast club pattern! So fun! LOL! I have that exact same Reader's Digest's Complete Guide to Needlecraft book! My sister found it at a second hand shop. You weren't the only super-cool 12 year old out there with cross stitch supplies! I was 11 when my aunt taught me how and have been hooked ever since! I've only done embroidery a couple of times but with all the cute designs it is in my to-do list again. Thank you! I have a large selection of vintage embroidery patterns and your window trick is perfect because I don't want to ruin them.